FIELDPROC is not encryption, it is an exit point. What IBM is providing with FIELDPROC is the opportunity for you, the customer, to implement encryption at the column level. You have to enable the option, provide the IBM i AES encryption software, and do the implementation yourself. This is different from SQL Server and Oracle TDE where the database does the encryption for you. Operations are on encrypted data. In SQL Server and in Oracle, the database is decrypted and then the SQL operations take place on the plaintext values. Not so in DB2 FIELDPROC. The necessary information is first encrypted, and the operation takes place using the encrypted value. This can lead to some surprises if you are not careful about your approach to AES encryption and Initialization Vectors. Decryption might not be called on a read operation. Some IBM i customers are surprised that FIELDPROC may not be called when doing a “read equal” type of operation. In SQL this can happen in a SELECT clause with a WHERE statement. In the RPG language this can be a CHAIN operation with a key value. The DB2 database will call the FIELDPROC application to encrypt the search value, but not call the FIELDPROC application if the search is satisfied. That will defeat your attempt to do data masking on decryption! Database joins need special care. Database joins take place on the encrypted values, not the decrypted values. This means that identical values in different tables need to have the same encrypted value. This runs counter to normal encryption thinking in database tables. FIELDPROC applications are dynamic calls. The FIELDPROC applications that you or your vendor creates are going to be called dynamically from the database engine. This means that when you develop the FIELDPROC application you have to take special care that they perform exceptionally well, and that your encryption library is optimized (see next item). Not all AES encryption libraries are equal. There are big performance differences between AES encryption libraries and it can mean a really big difference to your FIELDPROC application performance. We’ve noted before that AES encryption library performance can vary by a factor of 116. That difference can mean a batch job that takes 10 hours or 10 minutes. Be careful! 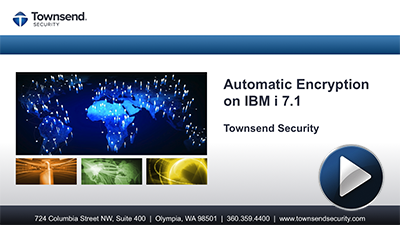 For further information view our webinar "Automatic Encryption on IBM i V7R1" and learn how Automatic Encryption is now possible on IBM V7R1 with AES/400. View this webinar to learn how easy automatic encryption with FIELDPROC is on your IBM i.
Simplify your encryption project. 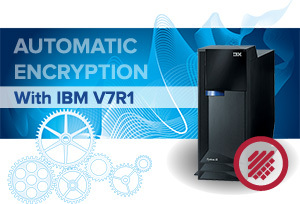 Encrypting data easily, automatically and securely on the IBM i is possible using the new encryption capabilities with V7R1 and AES/400. I recently sat down with Patrick Townsend, Founder and CEO of Townsend Security to ask, what are the five things customers need to know to help their organization automatically encrypt sensitive data on IBM i V7R1 with AES/400? For even more information on automatic encryption on the IBM i, view our webcast below! In release V7R1 of the IBM i operating system IBM enabled it’s customers to implement automatic encryption using a new column-level API called FIELDPROC. FIELDPOC is an exit point that sits at the column level of the database and enable IBM i users to implement encryption and decryption without making any changes to their application source code. 2. We’re at V7R1, now what? Upgrading your operating system is a start, however, IBM doesn’t provide the actual exit point software IBM i shops need to automatically encrypt and decrypt data - third party vendors and customers must do this. Townsend Security’s AES/400 solution enables organizations to implement automatic encryption. AES/400 and the FIELDPROC exit point in V7R1 give companies to easily encrypt sensistive data. We call it automatic encryption, because it is the easiest, fastest and most secure way to encrypt data on the IBM i. 3. What types of data can be encrypted? IBM i database applications use a variety of fields to store sensitive information. Encrypt fields that store data such as credit card numbers, SSN, birth dates, address, account numbers and other PII instantly without impacting applications. Alliance AES/400 FIELDPROC support will protect any of the above mentioned fields without changing your database or your business applications. There is no need to reformat your database, or expand field sizes. While most IBM i customers will use FIELDPROC encryption with legacy RPG and COBOL applications, FIELDPROC support also works with SQL applications, and Alliance AES/400 supports both program models concurrently. Your ILE and OPM applications will work well with FIELDPROC data protection. You do not have to have the source code for your application to implement Alliance AES/400. 4. Are there any security risks with automatic encryption using FIELDPROC? Native IBM i object or user authorities will not protect encrypted data. Automatic encryption and decryption works for all users and applications. Administrators cannot rely on native IBM i object or user authorities to control access to protected data, additional controls and policies must be put in place. 5. Will automatic encryption impact performance? 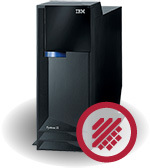 The IBM FIELDPROC exit point works by calling the exit program for each database insert, read, or update. The exit point program is also called on certain query and file positioning operations. 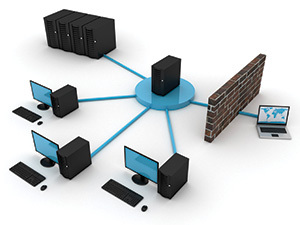 The right encryption solution can help minimize impact to system performance. Alliance AES/400 FIELDPROC support has been optimized for performance. The Alliance AES/400 encryption APIs are capable of encrypting 1 million credit card numbers in less than one CPU second. They are highly optimized for performance, and perform up to 100 times faster than equivalent IBM APIs on the IBM i platform. These same Alliance AES APIs are used for FIELDPROC encryption. For more information on automatic encryption using FIELDPROC on the IBM i, view our webcast. Your Encryption Project Just Get Easier!! No one wakes up in the morning and says they want to encrypt their data, other than those of us at The Encryption Company. We love to help companies get started with encryption and we love to talk about it. Those facts aside, much of the IT world views encryption as an onerous project and one they will avoid until an auditor says they have to meet a compliance requirement for PCI, HIPAA, etc. The good news for IBM i shops is that the latest release of the O/S, V7R1, just made it easier for them to embrace an encryption project, instead of avoiding it. The most significant update in V7R1 is the introduction of the FIELDPROC exit point, which provides for an exit point at the column level of the database. We were so excited about what FIELDPROC does for IBM i customers that we updated our AES encryption solution, AES/400 to support FIELDPROC. This enhancement enables future and current AES/400 customers to implement automatic database encryption on the IBM i.
AES/400 version 6.0 allows administrators to apply instant field (or column level) encryption routines without impacting applications. Administrators can also enforce what users and what applications are allowed access to the protected data. Rather than rely on native IBM object level security, which is often not implemented correctly, simply specify which user and which program has access and exclude all others. That’s it! Around the office we are calling it push button encryption because it really is that simple to implement encryption at the database level. To paraphrase Staples (a long-standing Townsend Security customer), Automatic encryption – that was easy! Request a demonstration today and let us show you how your company can be encrypting and decrypting data in a matter of hours rather than weeks.